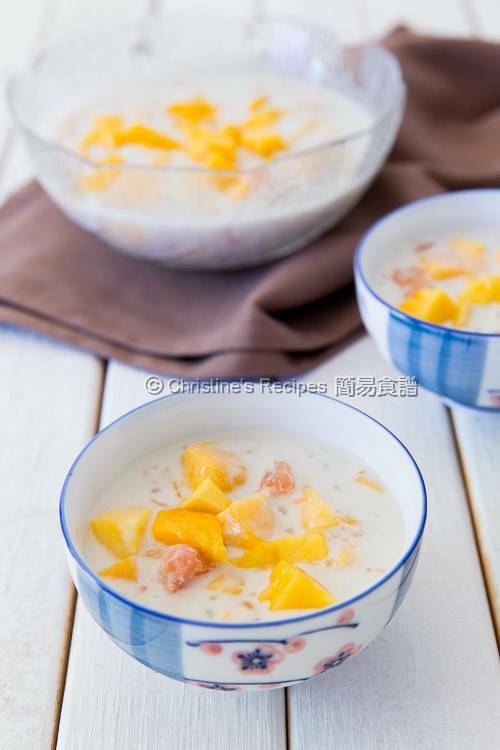 You can find this popular dessert, Mango Grapefruit Sago in Coconut Milk (楊枝甘露) on the menu of many Chinese restaurants in Hong Kong, often used to wrap up a dinner in summer. I love every dessert that made with mango or sago. It’s a dessert soup combining both. I’m ready to indulge myself with it. It’s mango season down under here. That’s another good reason to make a large bowl to entertain the family as well. This chilled dessert perfectly wrapped up our dinner in a hot summer night. When it comes to make this dessert, it’s absolutely easy. The recipe is very forgiving too. 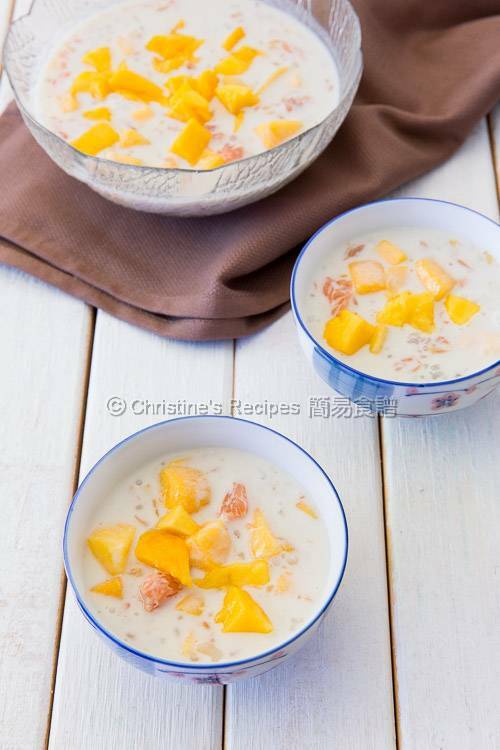 You simply mix some mango pulp with grapefruit meat in coconut milk syrup. Then chill it in fridge for serving at any time. This dessert is so tasty, refreshing, nourishing, and can help beat the heat here. Traditionally, pomelo is used instead of grapefruit, not easily found here during summer though. I’m totally into this nutritious grapefruit with rich antioxidants. Its slightly bitterness perfectly balance the sweetness of the whole dish. Having said that, you may keep using pomelo when you make your own. Put sago into a pot of 1 litre of boiling water. Bring it boil again. Remove from the heat and keep the lid on. Let the sago cook in the residual heat for about 10 to 15 minutes, until translucent. Drain through a sieve. Rinse with running cold water. Drain well. Set aside. To make syrup: In a small saucepan, put rock sugar with water together. Bring it to a boil over medium heat and cook until the sugar is completely dissolved. Let it cool completely. Peel the grapefruit and separate the flesh. Cut the mango flesh into cubes. Use a large mixing bowl. Put in the mango and grapefruit. Pour in the coconut milk as well as milk. Mix in the sago and syrup. Refrigerate for 2 hours. Enjoy ! If it’s not the mango season, canned mango can be used instead. Grapefruit has a slightly bitter taste. To myself, I like its subtle bitterness taste. 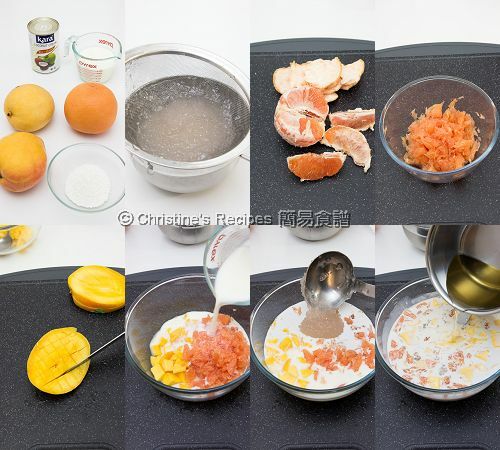 Use pomelo that’s sweet instead if desired. The amount of mango flesh can be adjusted to your preference. Or blend half of them in a food processor to make a paste, then mix into the coconut milk syrup. You can adjust the amount of rock sugar to your personal liking. Very delicious! I like that you have added grapefruit in it too. Christine, I'm lactose intolerant, can you just use more coconut milk in place of the regular milk or soy milk? Yes, you can use more coconut milk instead. If you find it's too thick, you can replace some water or use soy milk instead. This recipe is very forgiving. It look so good , absoluly I will try to make it. Thank you so much.Happy New Year!! Think that you'll love it if you try. Happy New Year ! I've never seen sago pearls before here. Will tapioca pearls work? Thank you for your reply Christine. I made it tonight with mixed frozen fruit (no mangoes here during Canada winter) and blood orange. Husband and daughter love it! I love your site and has made numerous recipes with great success! Since my mother's name is also Christine, but she lives faraway, it's like having a "virtual mother" to consult your recipes when I'm stucked with dinner ideas. Many thanks! A very clever idea of using frozen fruit to make this cold dessert. I love blood orange too. I'm so glad to be your "virtual mother". Feel free to visit me whenever you need any dinner ideas. What type of coconut milk do you use? I used coconut cream, but it is a lot of fat in the dessert, but if I use coconut milk, the flavor might taste very week? I feel in the restaurant they taste quite thick and very little fat! I used Kara coconut milk. I found it's not too fatty. The flavour is enough. Coconut cream contains more fat than coconut milk. You may use half coconut cream and half coconut milk. See if you like the taste. I wouldn't recommend you make this dessert too long before serving your guests as the fresh fruits will become too soggy if they are soaked in the coconut dessert soup for too long. 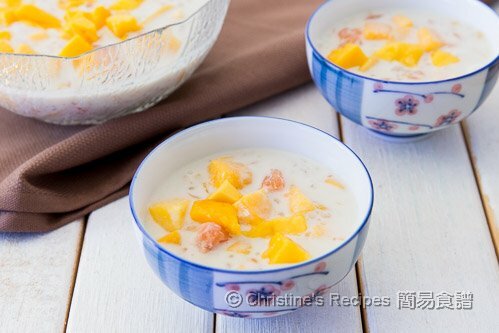 You may make the coconut dessert soup in Friday night, store your cooked sago in another container, then cut the mango in the Sunday morning. It should be very quick to put all things together for your guests. Any chance you could make this print friendly? Check out the print preview. There's a print friendly version available, if you click the link of "printable recipe", just above the 2nd photo. Hi Christine, thanks for sharing your recipes! I really enjoy cooking them and showing off my new skills to my family and friends!! Glad that you love my recipes. Your family and friends are so blessed to have you cooking for them to try. I just use the coconut milk straight from the can whenever I make cold drinks.